Nowadays, in the US, Sparrow Club is an organisation for young people to help other young people who are ill or in trouble. 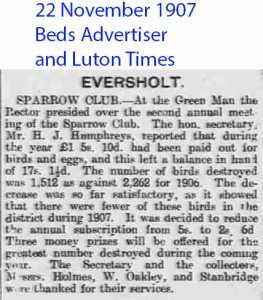 Back in 1906 Eversholt, it was a Club to pay kids to kill sparrows. Lots of places had sparrow clubs. The earliest reference I [EJW] have found is from 1831, although the OED only credits a quote from 1886. Farmers would chip in to a kitty, the club, and the club would pay out to anyone who turned up with dead sparrows or eggs. The aim was to reduce the loss of crops to birds. I wonder how careful they were about bird species? House sparrows might indeed eat crop seeds. Dunnocks – hedge sparrows as was – are insectivores and might help suppress insect crop pests. Anyway, they seemed to think of it as a cross between Young Farmers and the Army Training Corps. Some disapproved but the kids liked the killing and the cash. 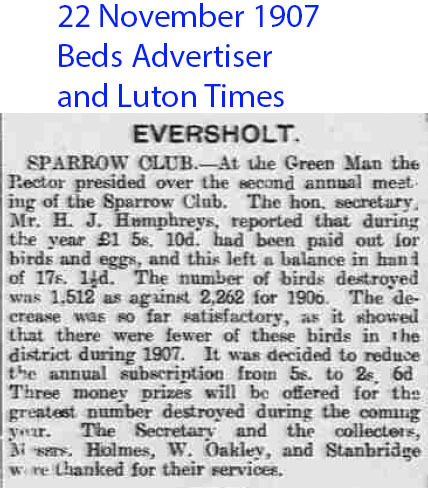 Eversholt Sparrow Club seems to have been formed in 1905 and to have lasted a couple of years.